New to town? Just traveling through? Been here for years but ready to break out of your work-groceries-home routine? No matter what category you’d put yourself in, Tulsa and the surrounding areas in Green Country have a lot to offer you. Believe it or not, this section of Oklahoma is not just a spot on the map between New York and California. And it’s not just a setting for John Steinbeck’s e Grapes of Wrath either. But with our busy lives, it can be easy to overlook what we have to offer to visitors, newcomers and longtime Oklahomans alike. 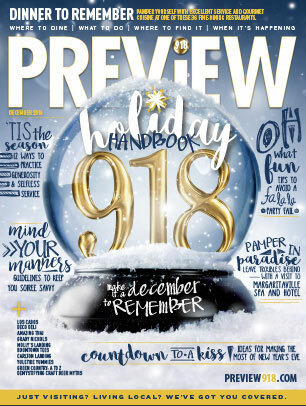 That’s why we’ve put together what we like to think of here at Preview as the most definitive list of what to do in the 918 area code. We’re calling it Tulsa A to Z ... 26 places and activities that will keep you exploring the depths of Green Country for a long time. This intricate architectural style boomed during Tulsa’s oil heydays. Many examples still exist, like Boston Avenue Methodist Church, the Philtower and Philcade. See Westhope and the Price Tower, both visions of legendary Frank Lloyd Wright. Attend the annual Deco Ball at the Mayo Hotel, which has hosted celebs like Lucille Ball and Elvis; the event helps preserve the area’s art deco history. Sure, we have great malls. But to enjoy Tulsa’s unique flavor, you need to visit our specialty stores. Some are homegrown, like Drysdales Western Wear, Jules Boutique and Lokal and Main. Some feature works by local artists, like Dwelling Spaces and Ida Red. Some are celeb-worthy, like the Pioneer Woman’s Mercantile and Rustic Cuff. All are fun places to spend some green. in Tulsa. (For outdoor movies, hit the equally cool Admiral Twin Drive-in.) Circle Cinema features indie films as well as major run movies and is home to the annual Tulsa American Film Festival. a must. Enjoy the First Fridays art crawl; highlights are the glassblowing demos and street music. Go to Antoinette’s or Glacier Confection for homemade sweets before you head home. At the entrance of this massive fairground stands the Golden Driller, a 75-foot-tall, 43,500-pound statue of an oil worker — the fourth tallest statue in the country. Get a selfie at his booted toes. And then come back for the many activities that happen there, like the Tulsa State Fair, Arabian Horse Show, Wanenmacher’s arms show, An Affair of the Heart, flea markets, huge craft shows and more. Green Country loves to eat. 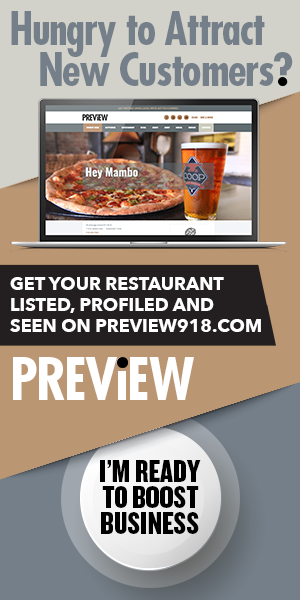 Sushi, Italian, Indian, Tex-Mex, steak, seafood, Mediterranean, diner food ... we have it all. 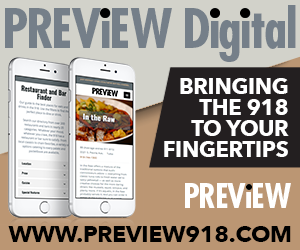 Some restaurants are local legends, like the Savoy, which has been owned by the Kelamis family for nearly 100 years, and Celebrity Restaurant, whose owner Mike Samara helped pass liquor laws that allow you to order open drinks at meals. Out of tragedy, good things can be born. In 1921, this booming area known as Black Wall Street was burned down during the bloodiest race riot in U.S. history. Today, you can look toward a better future by touring the Greenwood Historical District and visiting John Hope Franklin Reconciliation Park, which features two sculptures and bronze informational plaques to promote education and reflection. Lace up your all-terrain boots and get out to one or more of Green Country’s many hiking spots for a few hours of healthy outdoor exercise. Among the many places with walking and hiking trails are Turkey Mountain, Red Bud Valley Nature Preserve, Oxley Nature Center, the Keystone Trail, Woolaroc and Greenleaf State Park. Memorabilia, collectibles and more. Who doesn’t love antiquing? Because the I-44 Antique Mall is along the highway, it attracts travelers from all over the country. Visiting celebrities have been known to shop there. Locals also love Main Street in Jenks, where you can and Miss McGillicutty’s, Antique NV, The Pink Lady and other shops dedicated to nostalgia. 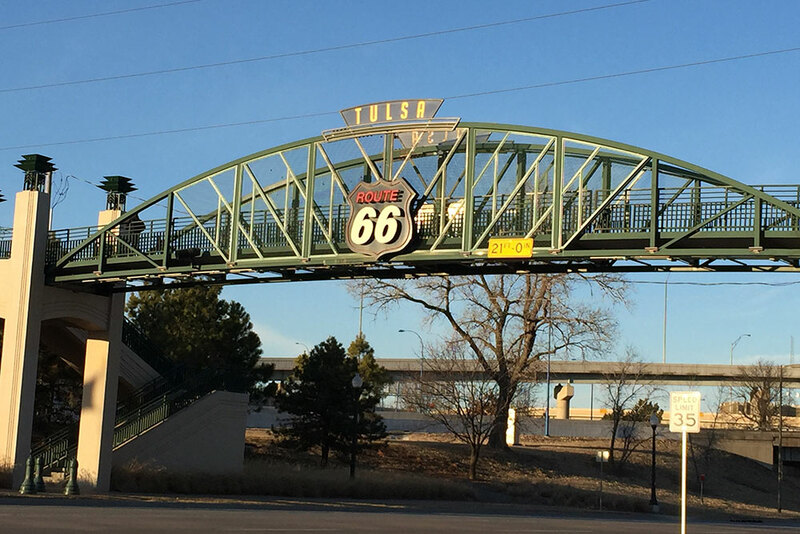 Tulsa has a rich jazz history. The nonprofit, educational Jazz Hall of Fame is situated in the Depot, an art deco train station converted into an intimate music venue. Regular concerts feature traveling artists, jazz ensembles, military bands and more. Free jazz and blues jam sessions happen every Tuesday 6-10 p.m., while Wednesday night spotlight sessions are only $10. Families, this one’s for you. Safari Joe’s H2O is a perfect place to cool off during the summer. Incredible Pizza and Andy B’s offer fun and games for young ones. Jenks hosts the Oklahoma Aquarium. Cut down a Christmas tree at Owasso’s Christmas Tree and Berry Farm. Take the explorers in your family to Discovery Lab at the Tulsa Children’s Museum. is green, at least in part, because of all the lakes scattered throughout northeastern Oklahoma. Have some fun on the water or just get away from the city grind. Tour the historic Pensacola Dam at Grand Lake. Go stargazing and kayaking at quiet, luxurious Carlton Landing on Lake Eufaula. Camp at Lake Greenleaf. Sun yourself on the sandy shores of Keystone Lake. Tulsa has superb museums. The Philbrook Museum of Art on Peoria is housed in the Italian Renaissance style villa once owned by oilman Waite Phillips. Its gardens are particularly stellar. The Philbrook Downtown features more modern art. The Gilcrease has an extensive Native American and Western art collection. The Sherwin Miller Museum highlights Jewish art and history. There’s fun and history to be found all over Green Country. Visit the Will Rogers Memorial Museum in Claremore. Take a tour of the Port of Catoosa, an inland seaport and industrial complex. Bartlesville is home to the stunning Woolaroc Museum and Wildlife Preserve. Drive through Checotah, Carrie Underwood’s hometown. Visit the Castle of Muskogee for the Renaissance Fair, Halloween haunts and Christmas entertainment. You don’t have to be religious to walk the campus at ORU, where you will see some of the most unique architecture anywhere. You’ll want to see the futuristic gold and white buildings; the gold geodesic dome of Howard Auditorium; the spindled Prayer Tower, an abstract cross and crown of thorns; and the iconic Praying Hands, which at 60 feet high is the largest bronze sculpture in the world. Tulsa and the surrounding areas offer a plethora of parks for family picnics, celebratory photo taking and flower gazing. 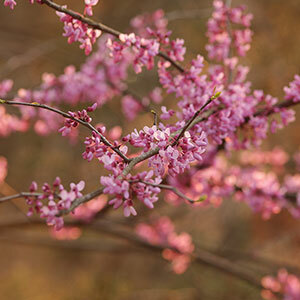 Woodward Park features the Linnaeus teaching garden, with a beautiful array of flowers, trees, bushes and ground cover plus a bubbling koi pond. 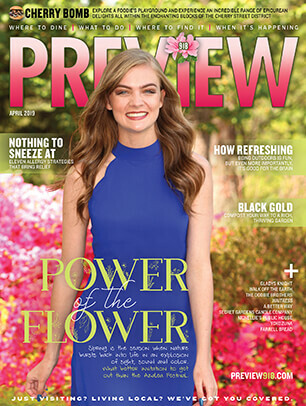 Head to Muskogee during the Azalea Festival at Honor Heights Park. The colors and landscaping are stunning. Roadside attractions and Oklahoma go hand in hand. Along Green Country’s section of Route 66 you’ll find the Blue Whale (Catoosa); the Big Round Barn; the world’s largest concrete totem pole (Foyil); Chris Barbee’s Bowling Ball Yard (Nowata); the world’s largest collection of Evel Knievel relics (Miami); the USS Batfish, a WWII submarine (Muskogee); and the Bart Simpson Tree (Vinita). One of the most scenic spots in Tulsa, Riverside Drive parallels the Arkansas River from the north side to the south side of the city. Walkers, joggers, runners, cyclists and skaters take advantage of the exercise lanes built along the road and river. Eat burgers and beer at the Blue Rose Café. Enjoy margaritas, live music and a poker game at River Spirit Casino’s Margaritaville. ‍Roadside attractions and Oklahoma go hand in hand. With a history that includes Wild West bandits, the Trail of Tears, oil barons, speakeasies, brothels and prohibition, it’s no surprise Oklahoma has ghost sightings a-plenty. Whether you’re a believer or a skeptic, a ghost tour is fun for seeing historic spots. Tulsa’s ghost tours bring you past popular bars like the Hunt Club, Yeti and Caz’s, so you can stop for drinks along the way. e Tulsa Performing Arts Center is home to the area’s traveling Broadway shows throughout the year, such as Wicked, Phantom of the Opera and Elf: The Musical, as well as the Tulsa Ballet and Tulsa Opera. If you like smaller venues, try Theatre Tulsa, the historic Brady theater, the Broken Arrow PAC and others. 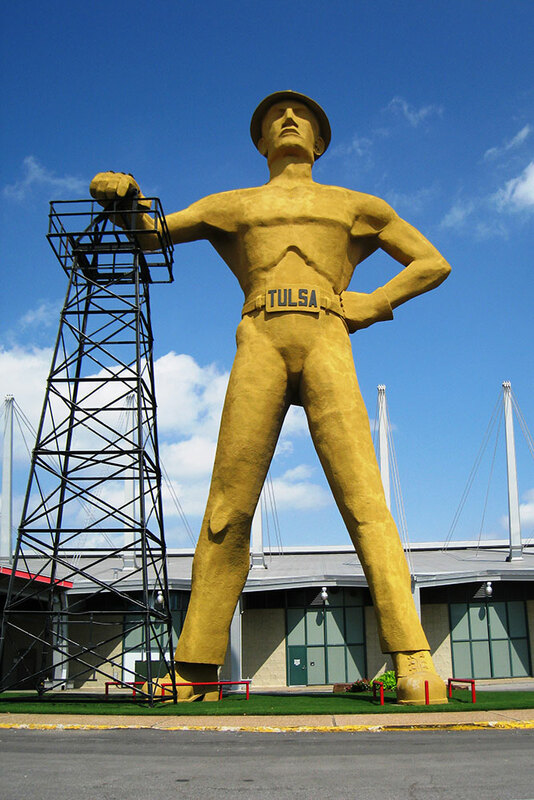 The Golden Driller, a 75-foot-tall, 43,500-pound statue of an oil worker, is the fourth tallest statue in the country. Music is one of Tulsa’s backbones. Plenty of Oklahoma musicians and groups have gone on to fame. And many of them have played spots like Cain’s Ballroom. 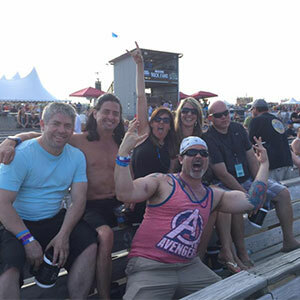 If you like live music, hit up live music and bar venues such as the Vanguard, Mercury Lounge, Hunt Club, Soundpony, Hodges Bend and Fassler Hall. Ah, the music of Woody Guthrie, an American icon. Lots of people love him, but only one city houses his legacy. The Woody Guthrie Center holds over 10,000 items — original lyrics, notes, artwork, recordings, photos — that chronicle the life and music of this Oklahoma singer-songwriter. Guthrie’s musical protégé, Bob Dylan, also has ties to Tulsa; Dylan’s archive is making its home at the University of Tulsa. No doubt about it, Green Country likes glitz at holiday time. Rhema Bible Church in Broken Arrow creates a glowing wonderland with over 2 million lights, some synchronized to music. A near-mile stretch along OK-117 (off Highway 75 toward Sapulpa) is decorated with nearly 2 million lights. Woolaroc boasts nearly a million, Honor Heights Park in Muskogee more than a million. That’s a lot of electricity, all to entertain you. Up dog, down dog, inversions, hot ... Whatever flavor you crave for your yoga fix, you can find it here. Even the YMCA offers classes. There are tons of yoga studios around town with quiet spaces, certified instructors and mindful meditations. One of our faves is Be Love Yoga, located in Jenks, Broken Arrow and 6th Street. Tell Joe we sent you. Namaste! With 1,500 animals representing 436 species on 78 acres, you can’t miss with a trip to our zoo. Travel the world as you see African penguins, Asian elephants, California sea lions, giraffes, crocodiles, chimpanzees and more. Various ecological exhibits promote understanding of life in the desert, wooded areas, oceans, cold spot and rain forests. Take your little ones to the children-friendly petting zoo. 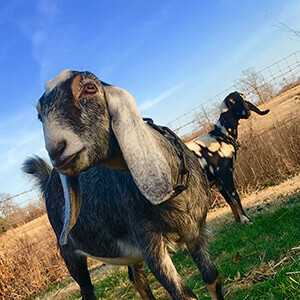 Goats as pets is a growing trend. People get them for a lot of reasons like milk, entertainment, companionship, or keeping some of the weeds trimmed. But they are also a lot of work. 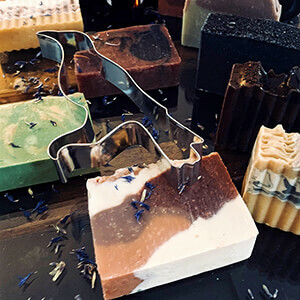 From yesteryear pioneer chore to modern day artisanal adventure, soapmaking is inspiring handmade movement enthusiasts and soaping entrepreneurs — one batch at a time.